Canada's brewers would like you to know that beer brews prosperity. 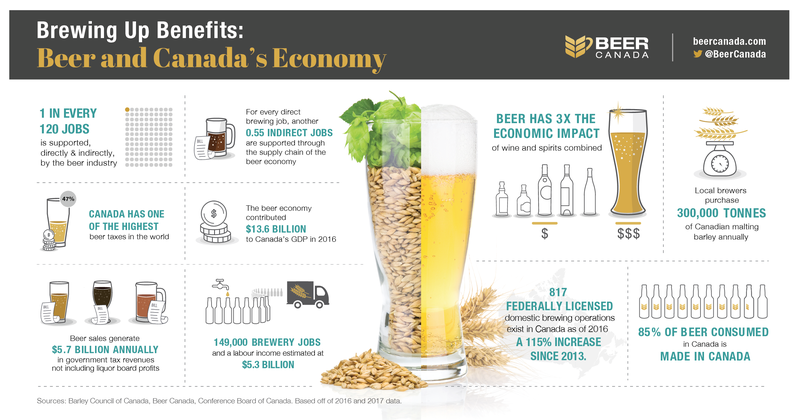 To promote the many important details as to why beer makes Canada's economy hop we created the below infographic. Beer is Canada’s most popular alcohol beverage, followed by wine and spirits. Brewing is one of Canada’s oldest industries and Canadian brewers today hold an 85% share of the domestic beer market. Canada has many competitive advantages in making world-class beers: proximity to malt barley, large fresh water supply, educated workforce and more than 10 million local beer drinkers. To help us understand the impact of beer today, Beer Canada has commissioned the Conference Board of Canada to study the beer economy with the first study taking place in 2013 and the second in 2018. Click here for the full 2018 report.